Ideally affix the track or pole before taking measurements for your curtains or measure from existing track or pole. 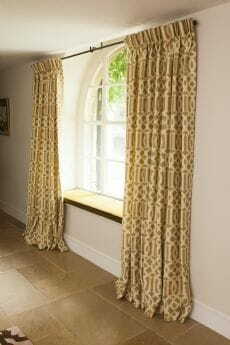 If affixing a new track or pole it should extend beyond the window at either side by about 15-20 cm to allow the curtains to be drawn back away from the windows during the day. It should also be placed about 15cm above the window to maximise the light. Measure the full length of the track, if the track overlaps you must include the overlap. Measure the full length of the pole and do not include the finials. 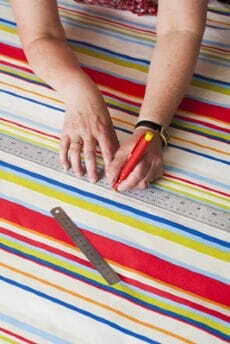 Measure the length from the top of the track to ensure it is covered by the curtains. Measure for pencil pleats from the small ring at the bottom of the curtain ring on curtain poles. Measure tab top curtains from the top of the pole. "Just wanted to say thank you for getting my cushions made so quickly, they look great in my living room. The finish is excellent and just how I wanted them. I will certainly be in touch to use your friendly and helpful service again."